The “AP” series dock leveler brings value, power, and performance to you operation by providing the power of air at a price that rivals mechanical dock levelers. The “AP” series dock leveler uses a high volume, low pressure, 115V fan to inflate an air bladder to raise and position the deck. A lockout/tagout maintenance strut and lip service support strut ensure safe maintenance operations. Free-fall protection ensures the deck will not fall in the unlikely event a truck departs prematurely. The lip latching mechanism will yield in the event of a collision with the back of a moving truck. The legs are designed to maximize visibility when loading below the dock. The CentraAir pneumatic dock leveler is a proven, safe, and dependable alternative to mechanical and hydraulic levelers. It features an automotive grade air bellows system that draws air either from an existing air supply, or from a dedicated compressor. It has an integrated control system that allows for push button or manual activation via dual lanyards. 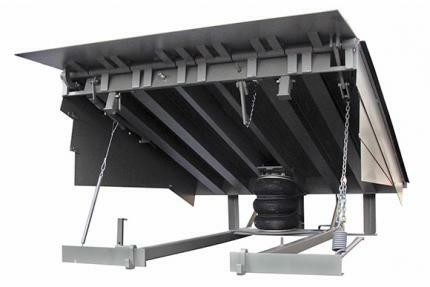 CentraAir levelers feature a lockout/tagout strut and lip supporting service strut to support the leveler and prevent inadvertent activation of the leveler during maintenance. The full height lip extension will collapse to reduce damage in the event of collision with the back of a truck. 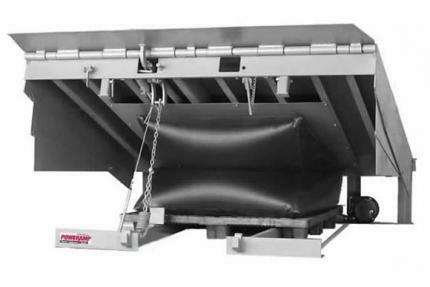 The bellows is extremely durable and clean-up of the pit is quick and easy using a quick connect blow gun.